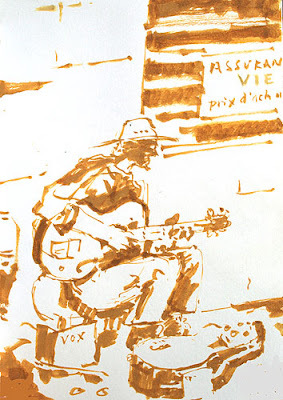 Electric Guitar Busker – ‘L’Assurance Vie’ – life insurance? Market day in Bergerac. Busker with electric guitar & vox-box on the pavements. I particularily liked the juxtaposition between him, the artist doubtlessly living in precarity, and the publicity for life insurance. Everything has its price & the price of a life of creativity is often financial insecurity. I thinK maybe this is part of the public’s attraction for buskers, other than of course, the fact they (sometimes…) make beautiful music.